Where is Mount Sinai? St Catherine's or Jabal al Lawz? May 2010 - News Flash.. Check out this amazing video of satellite imagery which shows a 1900 foot skeleton, next to the site in Saudi Arabia where Moses is believed to have received the 10 Commandments. 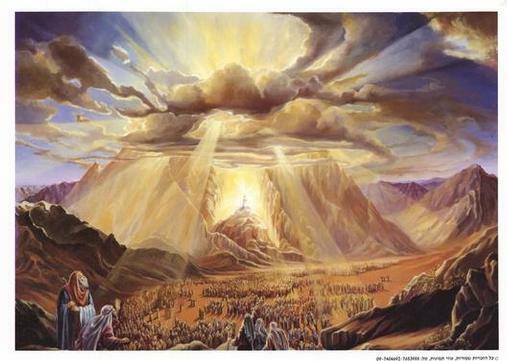 Many people believe this (Jabel el Lawz) is the real Mount Sinai site. Demetrius, Josephus, and other Jewish sources that identify Mt. Sinai with a discernible location consistently place it in northwestern Arabia east of the Red Sea. This early Jewish tradition of location Mt. Sinai in northwestern Arabia continued to find expression in a number of early Christian sources both before and after the growth of the competing Christian tradition that located Mt. 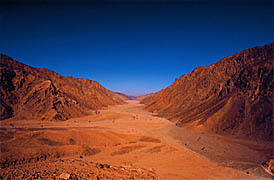 Sinai in the southern Sinai Peninsula. There is not a single piece of solid evidence that any Jew in the pre-Christian period ever located Mt. Sinai in the Sinai Peninsula. The notion that Mt. Sinai was located in the Sinai Peninsula must be understood as a purely Christian invention hardly different from the Christian identification of many other locations in the near East with ancient biblical sites. The mountain must be near Al-Bad ancient Madyan. The mountain must be the highest mountain in the surrounding region. This criteria is potentially decisive because it would limit one's options to just one mountain. Jabal al Lawz is uncontested as the highest mountain in the region of ancient Madyan, Jabal al Lawz also fulfills every other criterion stated above. Jabal al Lawz is probably the most convincing option for identifying the mountain with which Jews identified Mt. Sinai in the Hellenistic and early Roman periods. Jabal al Lawz may also be the most convincing option for identifying the Mt. Sinai of biblical tradition. The potential antiquity of the traditions associated with Jabal al Lawz is without parallel in the traditions associated with other sites. The evidence discussed earlier in this study demonstrates that traditions relating Mt. Sinai to the site of ancient Madyan at modern Al-Bad extend at least to the time of the oldest portions of 250 BC. In contrast, the earliest solid date for the appearance of traditions locating Mt. Sinai in the southern Sinai peninsula is ca. 350 AD. It is time for research on the location of the Mt. Sinai of pre-exilic tradition to shift its focus to Jabal al Lawz, which is associated with local traditions 600 years older than the traditions locating Mt. Sinai in the southern Sinai peninsula. Allen Kerkeslager, "Jewish Pilgrimage and Jewish Identity in Hellenistic and Early Roman Egypt," pp. 99-225 in Pilgrimage and Holy Space in Late Antique Egypt, edited by David Frankfurter (Religions in the Graeco-Roman World 134: Leiden, The Netherlands: Brill, 1998). See especially the map on p. 105 and the section of this article devoted to pilgrimage to Mt. Sinai on pp. 146-213.